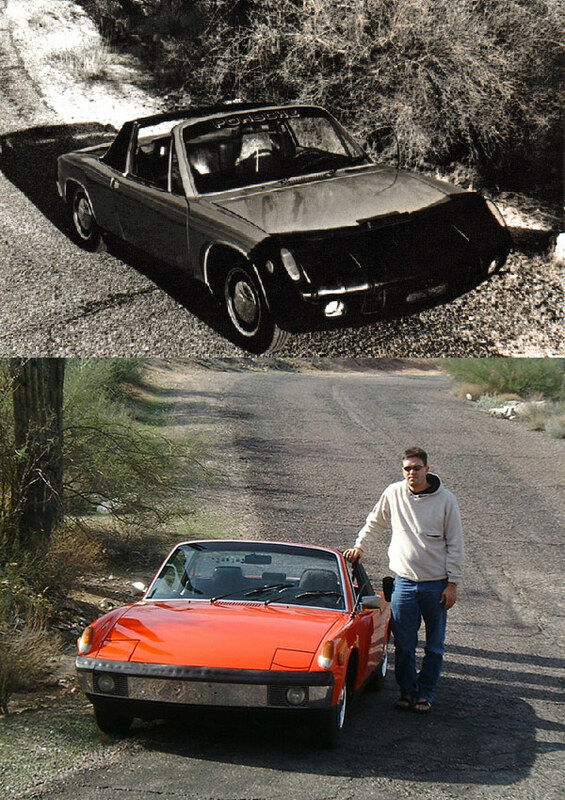 This is the tale of a boy and his car.... Below you can see a couple snapshots of my 1971 Porsche 914, this is my baby and I have owned her since I was 17. I have done pretty much all the work on the car myself, including sanding and prep for the paint job that was applied in 2002. You can see some snapshots of that job in progress if you click on the image at the bottom of the page. So what does this all mean to me? In general the car is in great shape and is a good driver for everyday use, although I only drive it a couple times a week these days. It is not stock either, the paint is a nice orange color that I rather like, similar to the Porsche orange of the time but a bit more red, the motor has been replaced with a 1.8L carbureted setup (old 1.7 went boom on me) and I have made some small outside changes to pretty the car up (reflector european lenses etc.). This car is a driver and part of me, I do not want to chop it into something that it is not, however I figured that it should be done the way I wanted to see it. Just thought I would put my baby onto my web page for everyone to see.